If you desire the time and a place to relax, Edisto can provide it to you. Edisto's lack of commercialization and easy laid back attitude will embrace you. This paradise lies at the end of the road (literally, the end of Highway 174) and is a place devoid of traffic lights and has a top speed limit of 35 miles per hour. A stopped clock doesn't mean much around here. Though Edisto remains unblemished by neon and drive-thrus, your vacation holiday can be filled with indulgences for the body, mind and spirit. You will find souvenir shopping a delight in a half-dozen or so of the most unique galleries and gift shops anywhere on the east coast. Local artists bring the exquisite beauty of the Island to canvas, furniture, jewelry and pottery and one of Edisto's local cookbooks, 'Pon Top Edisto, is a required take home reading assignment. You will want to explore the creeks and marshes on one of the many boat tours our local captains offer. View plantation homes from the water and visit secluded beaches for some prime time shelling. Or you can rent a canoe, kayak or motorboat and explore the waters yourself. Off-shore and in-shore fishing trips present an opportunity to bring home supper and forever after bore your friends with "the one that got away" stories. After you explore the Island via water, see the "high and dry" version of Edisto and the surrounding Lowcountry. Botany Bay Plantation on Edisto Island is a 5,000 acre nature preserve with 4 miles of unspoiled beach between Jeremy Inlet and Framptons Inlet, self guided driving tour to see old plantation site, catch and release fishing pond, (under 16 yrs old), hunting in in deer season, and a perfect place to bring your horse to a fabulous ride. Several land tours are available and each tour is unique in its own way, presenting history and legend via various perspectives. If you crave an aerobic heartbeat, rent a bike. Exploring the beach by bicycle is fun and safe with miles of designated bike paths just a step away from most doorways. The list goes on. . . play tennis or golf, check out the museums, visit a Serpentarium (FYI; that's a reptile museum). Or spend a long day under the shade of an umbrella with that paperback that has been calling your name. Just choose your pleasure. Life need not be complicated, at least while you are here. To discover your own peace of this haven, click here! 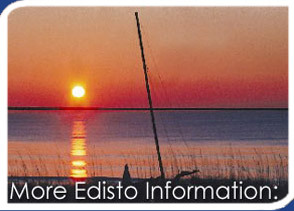 Request our free, comprehensive Edisto Real Estate Guide Packet. It's Loaded with valuable local real estate and complete multiple listings of all Edisto properties available for purchase - it's what you need to make a smart and informed purchasing or selling decision. Just fill in the form below to receive yours today!